There’s a great story behind this one. A few months back, Marc’s wife Stephanie contacted me and several of Marc’s artist friends on Facebook to recruit us for help with an amazing present for Marc’s 40th birthday. Those of you who follow Marc on Twitter and Facebook know he’s a prolific artist. He draws on post-its, napkins, sidewalks, sketchbooks–pretty much anything within reach, and he posts all of it. Stephanie wanted to give Marc art for his birthday, just like he gives so much to all of us. 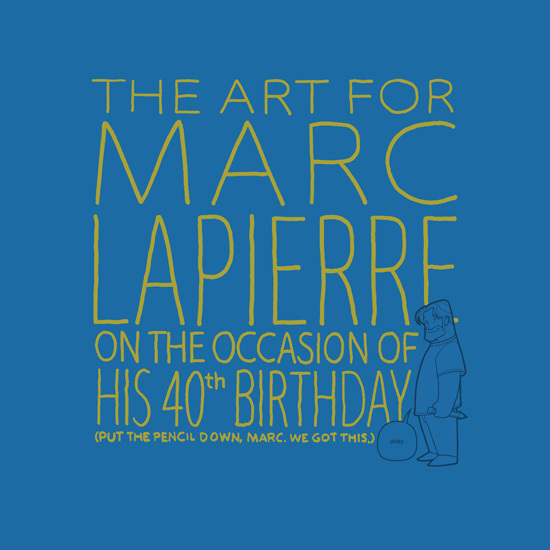 So, The Art for Marc Lapierre on the Occasion of His 40th Birthday was born. The hardest thing about getting the book together was keeping it a secret. I’m in communication with Marc pretty much every day because of SuperFogeys, but Stephanie had the far more difficult job of putting it together secretly AND not saying anything and making sure her kids and relatives didn’t say anything. That she pulled it off is nothing short of amazing. I’m told Marc was in tears this past Friday as he received it and looked through it. The cover, my other contribution to the book. Most of the art in the book was the sort of stuff Marc loves–pop culture mash-ups, 80′s references, tributes to his comics work, etc. 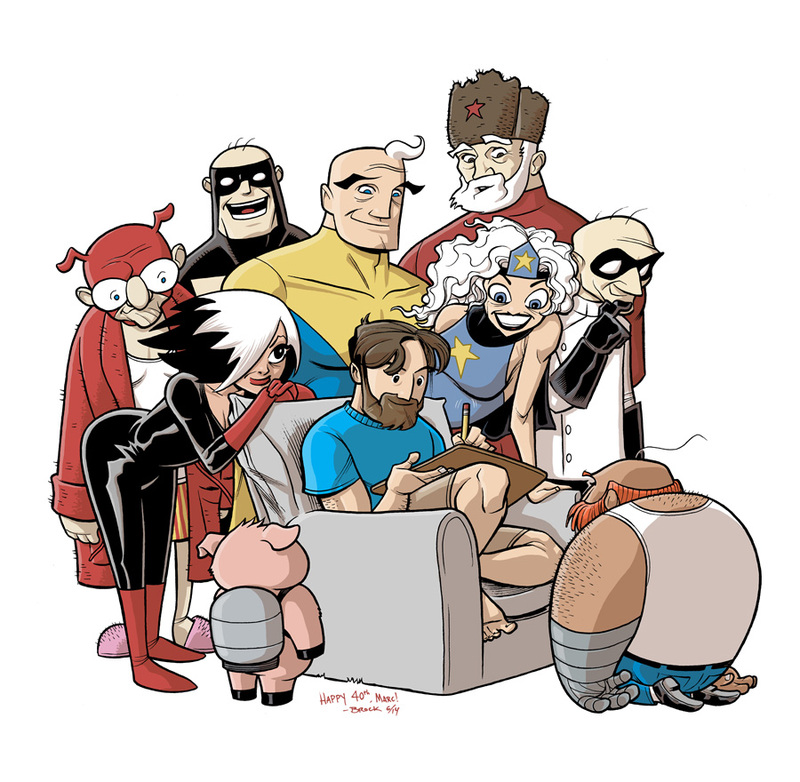 For my piece I wanted to do something that worked as kind of a thank you and an acknowledgement of how important Marc is to The SuperFogeys. I had Stephanie take a picture of Marc while he was drawing so I could get a sense of his environment. What you see above is exactly how Marc was sitting in the picture, in the living room. Dude does have a desk and prefers to draw where he can interact (and no doubt be interrupted by) his kids. Crazy. Happy Birthday, Marc! I know you say you didn’t deserve all this, but the rest of us disagree. Big time. See you all on Wednesday when the regular strip resumes! Cool Gift and Happy Birthday to Marc and his great art. I’ve enjoyed his Jenny Everywhere artwork on Jenny Everywhere Day (THIS WEDNESDAY, Aug. 13th). These kind of gifts are the best kind of gifts. That’s so sweet. Happy birthday, Marc! It would be neat if this book was made available for sale and the profits could be donated to charity, but I wonder if there might be licensing issues around that. I don’t think Stephanie is even thinking in that direction, but you never know. I don’t know about licensing issues just because most of the pieces that involve pop culture figures are mashups.